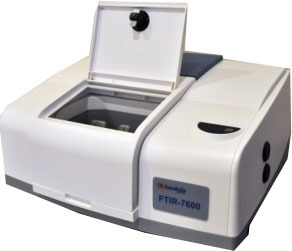 FTIR-7600 is a single-beam Fourier-transform infrared spectrometer with fast scan speed and high accuracy. This instrument is operated by a PC with user friendly software and a comprehensive manual. It is a valuable tool for various analytical applications in fields such as chemistry, medicine, food and beverage, wine industry, material engineering and quality process control. File and Edit: open, save, print, copy, paste, delete, etc. and options—customized settings for spectral collecting, displaying, processing, saving and printing. Collect: configure measurement parameters (resolution, averaging, range...), real time display spectral results with options of different modes and settings, and diagnose component status. Process: spectral conversions (A/T, Log, K-M...), spectral operations (smooth, add, minus, multi, norm...), and spectral corrections. Analysis: find peak, label, compare with lib, define settings for spectral search, search lib (select lib, add new lib, make lib...), and display results. Note: Spectral libraries are application dependent and are not included in the FTIR-7600 software. They can be acquired from vendors of FTIR spectral libraries. The FTIR-7600 can work with various sample phases using liquid cell, gas cell, pellet, cuvette, or ATR. It has a large sample compartment accommodating various FTIR accessories. Click here to select your accessories.